Whether you use a soft top or a hard top, protect it from weather and sun while parked with a nylon cap from JustforJeeps.com. This weather-resistant cap is available in either black or silver. The silver version keeps temperatures down in hot climates by reflecting sunlight. The cab cover attaches with elastic loops around tail lights and mirrors and two integrated cords attach to your Jeep under the doors. When not in use, the cover folds up into a storage bag that is included. 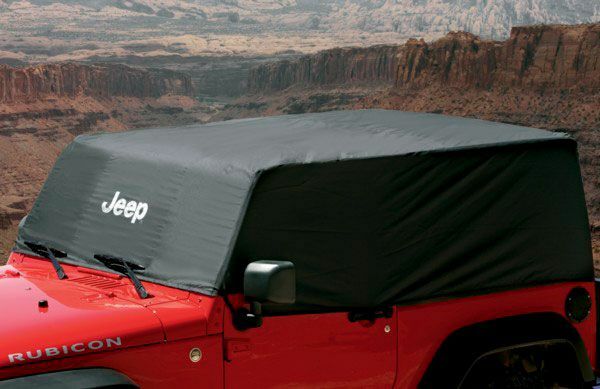 2-Door or 4-Door Black water-resistant nylon Cab Cover with Jeep logo. Also available in 2-Door or 4-Door Silver heat reflective Cab Cover with Jeep logo. Folds into a snap-closure storage bag (included). This item is designed to be used while the vehicle is parked only and is not meant for use while being driven or towed. Purchased this cover to protect my jeep when using without the hard top but the back section of cover does not cover the vehicle correctly.